#1. This week's number one is an international shooting guard Michael Roll (198-87, college: UCLA, currently plays in Israel). 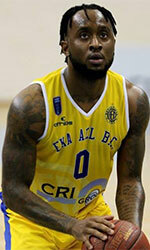 He could not help Maccabi T-A (12-4) in their last game. Despite Roll's good performance Maccabi T-A lost 95-100 on the road to the lower-ranked (#4) Hapoel Holon. He scored 14 points and added 3 assists in 24 minutes on the court. Roll has relatively good stats this year: 10.3ppg, 2.4rpg, 3.3apg, 2FGP: 53.7%, 3FGP: 51.1%(24-47) and FT: 95.2%(20-21) in 16 games he played so far. He is a naturalized American. Roll is currently a member of the Tunisian senior national team. Strangely he has never played in Tunisia. #2. Second place goes to former U19 international forward Wassef Methnani (203-98, currently plays college basketball in the States), who plays in the NCAA. Methnani was not able to help the Fairfield (2-5) in their last game on Monday. Despite his good performance his team was defeated 61-50 at home by the Siena College. Methnani scored 12 points and grabbed 7 rebounds. This season Methnani averages: 5.9ppg, 3.0rpg, 2FGP: 46.7%, 3FGP: 39.1% and FT: 75.0%. He played for the Tunisian U19 national team in 2015. #3. The Tunisian player who performed third best last week abroad was an international power forward Makram Ben Romdhane (205-89, currently plays in France). Ben Romdhane was not able to secure a victory for Saint Chamond (11-7) in their game against ADA Blois (9-8) in the French ProB (second division), despite his good performance on Friday night. He scored 12 points, had 7 boards, dished 6 assists and stole 3 balls in 27 minutes. But Saint Chamond lost 79-91 in Blois to the lower-ranked (#8) ADA Blois. It's Ben Romdhane's first season with the team. This year Ben Romdhane has relatively solid stats: 11.8ppg, 9.6rpg, 3.6apg, 1.7spg, 2FGP: 57.0%(69-121), 3FGP: 25.6% and FT: 49.4% in 18 games. He is also a member of the Tunisian senior national team. #4. Point guard Omar Abada (189-93, currently plays in France) is a teammate of previously mentioned Makram Ben Romdhane and both played together in the last French ProB game. Abada couldn't help Saint Chamond (11-7) in their game against ADA Blois (9-8). He scored 6 points. Saint Chamond was defeated 91-79 in Blois by the lower-ranked ADA Blois (#8). Abada's overall stats this season are: 10.0ppg, 1.6rpg and 2.6apg. He is also Tunisian national team player.